As we near the end of 2016, there are multiple reports that health care premiums are going to spike 25% and people are outraged…except for the ones that made the policy and these people below. If you’re upset and frustrated about your premiums going up, stop. You should be exponentially more pissed off over the products and services your premiums are providing. But I’ve never met an insurance broker that goes over the unfeatures of your insurance coverage. The part that baffles me the most is that people seem to ignore that they are paying a higher premium to access a system that is great in emergencies but has failed miserable in health promotion. In other words, you keep paying more for access to a system that will NEVER get you better. It’s about as effective as paying your monthly minimum balance on a 12% interest credit card and expecting to get out of debt. Our traditional healthcare system provides 2 options. Drugs and surgery. The companies that create and supply the products for your doctor to perform a service are publicly traded companies. Regardless of the industry, a publicly traded company has one goal and that is to create profits for the shareholders. When a company engages in activities that purposely lower the profits to shareholders, this is called fraud. This is illegal. If a pharmaceutical company were to create something that made you healthy and therefore created less need of their product, this would lower profits. In other words, they would be actively lowering the profits of the shareholders, which is illegal. Providing a cure would be fraud. When was the last time you saw a Lipitor commercial? Maybe as late as 2012? Why? Pfizer lost their patent on the cholesterol-lowering drug in 2011, opening the floodgates for other companies to make and distribute generic versions. Does this mean heart disease was cured and it’s no longer an issue? Hardly. It’s the #1 cause of death in our country for both men and women. Pfizer’s non-advertising strategy for Lipitor is because the profits for that drug were rapidly declining. They had to pull out. Why is it when there aren’t profits for Big Pharma, the urgency of that disease seems to disappear? Despite the faulty, dogmatic message that lowering cholesterol will save your life and the best product available is Lipitor, Pfizer looked for other diseases to capitalize on like cancer. What commercials do you see now? Cancer drugs. Ones that cost tens of thousands of dollars each month yet at best extend your life 90 days. Follow the money, not the health outcomes. Flooding the market with hundreds of minor variations seems to be the hidden business model of drug companies, to exploit patent and other IP protections for profits, not for significant advances for patient health. Looking back, Jerry Avorn, an authority on pharmacoepidemiology, wrote that “laws designed to encourage and protect meaningful innovation had been turned into a system that rewarded trivial pseudo-innovation even more profitably than important discoveries.” Donald W. Light Center for Ethics Harvard University. Stop Focusing On Your Premium. Start Focusing on the UnFeatures of What Your Premium Covers. What do you get for your monthly membership? Let’s look at the unfeatures of your health insurance club. You get the unfeature of stepping into a system, with mandated access by the federal government, of being the 3rd leading cause of death in our country, just from mistakes. 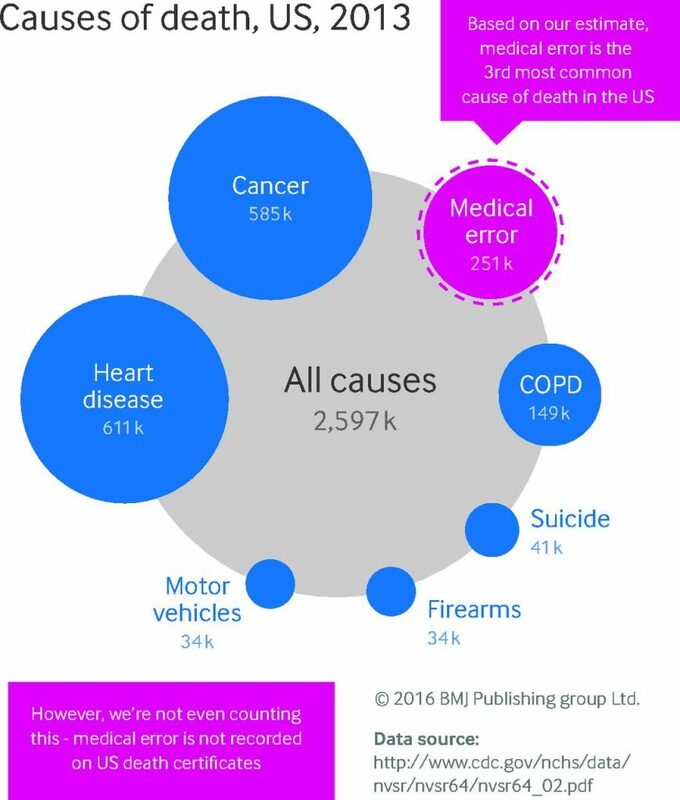 You get additional unfeatures of increasing your chance of death when you factor in the non-error deaths that occur from properly prescribed, properly diagnosed problems, increasing the death toll by an additional 128,000 people each year. You may not die but your properly prescribed, insurance covered health care will also send 1.9 Million people to the hospital. If that didn’t send you to the hospital but are there for another reason, 840,000 hospitalized peeps are given medications with serious side effects. But no one cares because it’s all covered. You can kill me but if I don’t have to pay for it, we won’t have a problem. The pharmaceutical industry refers constantly to its “R&D pipeline” of new drugs under development. But there is a second, parallel pipeline—the trial-journal pipeline. It consists of randomized clinical trials designed with the marketing departments to produce evidence that their drugs are more effective and safer than unbiased trials would show. Commercially funded clinical trials are at least 2.5 times more likely to favor the sponsor’s drug than non-commercially funded trials. The FDA accepts these biased trials and uses them to approve drugs. Congress strongly supports having companies fund the division that reviews new drugs rather than having the FDA be a publicly funded, independent reviewer and regulator. Financially, the FDA is an extension of the pharmaceutical industry and plays a major role in expanding markets for more people to take more drugs. Donald W. Light Center for Ethics Harvard University. You get access to a loving, healthcare provider, with great intentions that is recommending a course of action based on lies and exaggerations. Did you miss that part? “Clinical trials are designed with marketing departments.” I’m all for marketing but I don’t want my marketing department at the table when discussing the results of a clinical trial, especially knowing that product is part of the 3rd leading cause of death. And then our FDA allows them to self police their own research and reported conclusions. Seriously? Remember all those drugs that were pulled off the market from the FDA or the ones that get slapped with a black box warning? Those are the same drugs that got the gold standard and thumbs up approval from the FDA just a short time previously. And they are ALL covered with your ever increasing health insurance premiums. WINNING! These drugs may harm you seriously but who cares, you don’t have to pay for it. Maybe this is why we have a crisis with our doctors today. They serve in a mandated access system with people brainwashed that their level of insurance coverage equates to their level of health outcomes. If they make a mistake, there can be a grave result. And if they do everything right, there is still a chance of a grave result. But as they (the doctor) are dependent on an insurance company to pay them, they are forced to play by the rules of what insurance will pay them opposed to what is best for the patient. And where do the insurance companies get their information for safety and efficacy of the services and products they cover? From the self-policed, FDA approving, pharmaceutical company. While they play by the rules, they still have to fight to actually get paid. Many times, it’s months later. Your unfeature of insurance is working with a service provider that hates their job. I’m sure you’ve encountered people like this at entry level retail establishments. But these are doctors, their entry level costs them decades and hundred of thousands of dollars in education. Don’t you want a doc that absolutely loves what he/she does for a living? Instead of calling an office to see if they accept your insurance you should ask if the doctor loves their work. Ultimately you, the patient, gets frustrated because now your doctor doesn’t want to accept your ever increasing cost of access to use those insurance benefits. Name any other product or service that your yearly cost increases 25% AND your out of pocket expense increases before you can use that benefit. Imagine if Costco was modeled after our insurance system. You have been used to paying your yearly membership fee and routinely buy discounted products through them. Some people can’t afford a Costco membership but can apply to have the government subsidize their membership. No problem, you value a Costco membership and understand that some people are just in a season of rough times. The discounted products could help them. But the government is worried that not enough people have access to Costco and their cost saving products and free samples. Why would the government think so? Because Costco spends the most money on Capital Hill to lobby influence of your elected officials. Next year, that membership fee increases by 25% (even more if you have the executive membership) AND they put a stipulation that you have to buy $5000 – $10,000 worth of products at full retail fee before you can take advantage of any discounts. If you want your membership fee to be more affordable, all you have to do is increase your pre-discounted purchases to $15,000 or more. Why the increase? Because of those people that don’t have a Costco membership and the human right that everyone should have access to Costco products, regardless if they are safe or effective. But don’t worry, Costco says their products are safe and 2x better than any product you can get at a non-Costco store. Who released these safety and efficacy data points? Of course, it was the Chief Marketing Officer. Duh. As you shop, you notice the store is getting more crowded, especially around sample times, and the employees aren’t as friendly and are just tossing your products into your shopping cart after scanning them. The receipt checker rips the paper out of your hand and draws an anarchy sign for kids instead of a cute puppy. While more and more members enter the store, more and more employees quit in dissatisfaction. Your experience, quality, and satisfaction decline. You look for other stores to shop at but because you figure that since you have to pay the Costco membership, you might as well settle and only buy what they have to offer even with no advancement in products. They are still selling and recommending the Motorola Razor as the standard for cell phones. Some of your friends have said, ‘screw Costco, I’m heading to another store.’ Your friends rave about their experience, love the store employees, and get fantastic products and services that Costco doesn’t offer. Service is efficient, wait times are short, and results speak for themselves. You ask your friend if their favorite store accepts their Costco membership and they say no. Instead of trying that store, you just assume that it’s way too expensive and will only shop at Costco because you have their membership. You may have a few favorite employees or products but you want something better for yourself. You may even feel guilty for trying a different store. Instead of recognizing your self worth and pursuing a different product or service that is a better fit for your values and desired outcomes, you stay in the same system and complain that your membership dues keep increasing instead of highlighting the inefficiencies and outright dangers to having Costco only options. Costco is great for those bulk items but when you want or need specialty items, you have to look elsewhere. I think you get the point, sorry for the ramble. The biggest unfeature of your insurance is that it will NEVER cover the action steps that actually help you create health. You’ve been fed lie after lie that your level of health expression is dependent on your access to ‘healthcare’ services. The other lie is that your level of healthy outcomes is dependent on your level of income. The reality is that the 5 places in the world (Blue Zones) with the most centurions and lowest levels of chronic disease don’t have access to advanced medical technology nor are wealthy elites but use the tools at their disposal for building health centered around how they eat, move, think, their social and community patterns. If you want to create a different health outcome, the choice is yours. You may have to have ‘health’ insurance but you don’t have to use those services and products that it provides. You can directly access a plethora of different health practices in this nation, which can often be covered through your HSA. What you can’t do is whine, complain, and make excuses about your current situation if you have no intention to change your course of action. If you’re ready for different outcomes, you know how to find me. I took maters into my own hands 50 years ago. Now I am 78 years old and healthy.